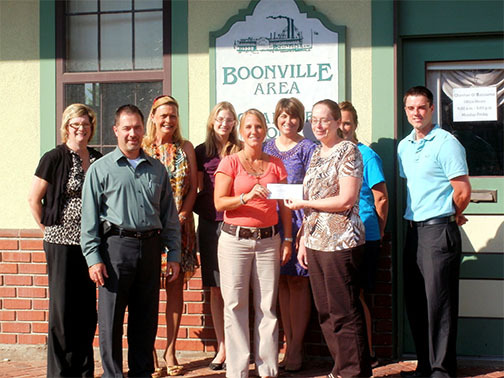 The Boonville Area Chamber of Commerce has a long-term commitment to our region. For over 110 years, the Chamber of Commerce has played an important role in defining what the Boonslick Region is and will become. The Chamber is dedicated to the future of our region and actively prepares to make the Boonslick Region a better place for everyone to live, work and play. The Chamber of Commerce makes it easy for members and local businesses to increase exposure, to participate in networking opportunities, and to access information and services that can help increase business prospects and effectiveness. The Chamber of Commerce is an advocate for improving our quality of life. The Chamber supports tourism and assists in helping businesses or individuals locate to our region. The Chamber leads the way to our region. The Chamber of Commerce serves our region through business and community interaction. To better serve those in our region, those visiting our area, or those planning to relocate to the Boonslick Region, the Chamber can provide an abundance of community information and referrals. The links below offer additional material and insight to our area.